Following various tutorial examples online (e.g. Hortonworks – How To Refine and Visualize Sentiment Data and Microsoft – Analyze Twitter data using Hive in HDInsight) it is possible to expose semi structured Twitter feed data in tabular format via Hadoop and Hive. Once the data is available in Hive it is possible to visualise this via Excel and the Power BI toolset. PS – The jar in question in Roberto Congiu’s JSON SerDe (binaries available here, and CDH5 version appears to be compatible with Hortonworks). DataSource.Error: ODBC: ERROR [HY000] [Hortonworks][HiveODBC] (35) Error from Hive: error code: ‘40000’ error message: ‘Error while compiling statement: FAILED: RuntimeException MetaException(message:java.lang.ClassNotFoundException Class org.openx.data.jsonserde.JsonSerDe not found)’. Message=ERROR [HY000] [Hortonworks][HiveODBC] (35) Error from Hive: error code: ‘40000’ error message: ‘Error while compiling statement: FAILED: RuntimeException MetaException(message:java.lang.ClassNotFoundException Class org.openx.data.jsonserde.JsonSerDe not found)’. 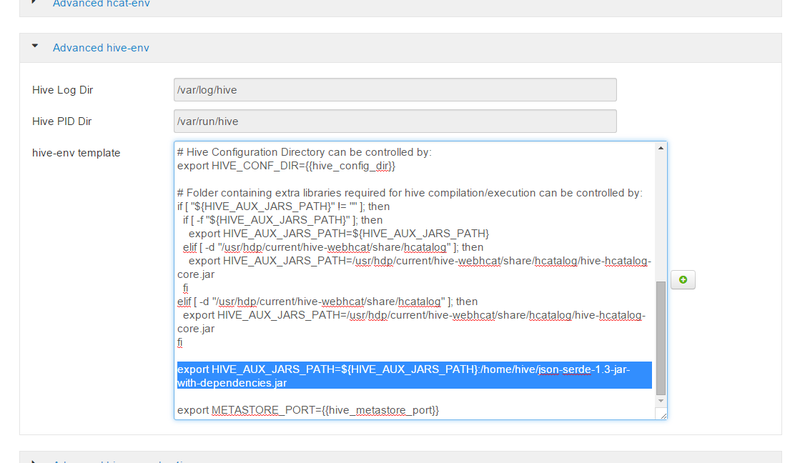 Finally – confirm ODBC is working by querying your Hive table / view in Excel or Beeswax! It should work without first running the “add jar” command, because the custom SerDe responsible for reading the JSON files is now loaded automatically when a session is opened. Which really helped me a lot. Even hortonworks didn’t post this solution(I couldn’t find googling).